The Smart Keyboard combines an array of new technologies and materials to create a keyboard like no other. 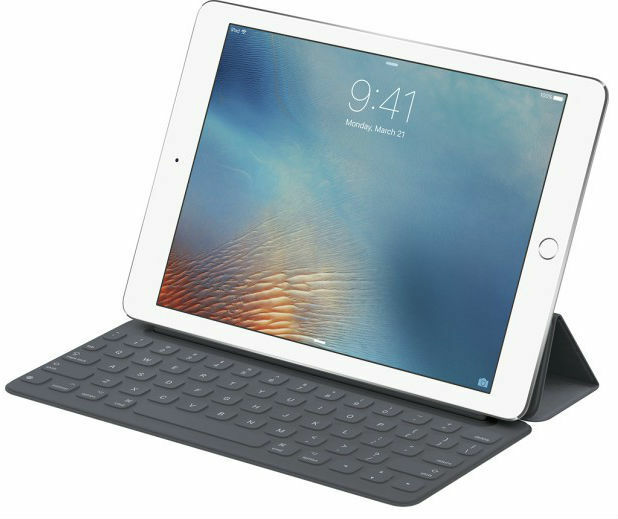 It’s a full‑size keyboard that’s fully portable, and connects to iPad Pro with the Smart Connector, an innovative new interface that allows for a two‑way exchange of power and data. Just attach the Smart Keyboard and start typing. And when you’re done it folds together to create a slim, lightweight cover. The new Smart Keyboard for iPad Pro has all the utility of an ordinary full-size keyboard, but its technology is far from conventional. The entire keyboard is draped with a custom-woven fabric that has been laser ablated to precisely define each key and ensure a satisfyingly fast and natural key feel. Below the surface of Smart Keyboard is a new conductive material. At just 0.1mm, it is nearly as thin as a piece of paper, yet strong enough to withstand a lifetime of folding. And it's why you won't find any batteries, cord or on/off switches with Smart Keyboard.